What kind of fringe patterns can appear? Which fringe patterns refer to object faults? Which object fault is related to an observed pattern? How these partial patterns can be recognized? Difficulties in answering these questions are due to the great variety of appearing interference patterns as well as by the fact that the coherent-optical measurement methods are sensitive only for affects of faults on the object surface. Flaws under the surface are detected by their effects on the surface due to an appropriate loading of the object. There are several fault catalogues where for chosen objects relevant faults and their recognition by holographic testing methods are investigated [1,2]. Different approaches for the automated recognition of fault indicating partial patterns by means of digital image processing and other modern techniques as neural nets and knowledge based systems are known [3,4]. But so far there is a lack of information on the problem what type of fringe patterns can appear at all and which of them are caused by material faults. This paper will give an answer on these two questions. The applied non-destructive testing method is holographic interferometry. Despite of the great variety of appearing fringe patterns an experienced human interpreter very often is able to detect material faults on the basis of fringe irregularities which are caused by a non homogeneous deformation of the surface. Both extended practical testing and systematic numerical investigations lead to the hypothesis that the appearance of faults in holographic interferograms can be reduced to a finite set of typical fringe irregularities [5, 6]. Five different partial patterns are considered, Fig. 1. Two of them are characterized by topological changes of the regular fringe pattern whereas the others show rather quantitative geometrical variations. The first partial pattern which is known as bull eye can be observed very often. It is marked by concentric fringes. The second one is the so-called groove. It typically shows systematic distortions of neighboured fringes which is connected with a local change of fringe curvature. A bend is defined by a local, sudden change of fringe direction of some fringes. Locally ending and laterally displaced fringes are called displacement. The compression is characterized by a change of spatial frequency of fringes. 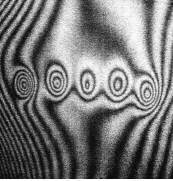 The proof that only these fault indicating irregularities or combinations of them can appear in holographic interferograms is based both on a description of fringe patterns by systems of ordinary differential equations and the physical relationship between object loading and resulting displacement. where a(x,y) and b(x,y) represent the additive disturbances (electronic noise, non-uniform background intensity, ...) and the multiplicative disturbances (local fringe modulation, speckle noise, ...), respectively. The phase difference d(x,y) contains the information about the displacement of the object surface between both states to be compared. Intensity distributions as expressed in Equ. (1) are characterized by patterns of bright and dark fringes. Bright regions correspond to intensity maxima whereas dark fringes can be observed in places of intensity minima. After reducing the fringe pattern to a map of dark and bright lines the resulting lines can be considered as contour lines of the phase difference d(x,y) Fig. 2.
through any point (x,y) exactly one contour line goes. Theorem 1: If the phase difference d is a differentiable function and if its gradient is not zero in an open region D then the contour line d-1(np) can be represented as a curve in the (x,y) - plane. Further, it follows from the definition of h that d is constant along the curve (x(t), y(t)). In this way it was shown that the determination of a contour line of a differentiable function d can be reduced to the problem to solve the system of ordinary differential equations (5). If additionally it is required that the contour line crosses a certain point (x0 ,y0) one will get a so-called initial value problem. Remark 1: From the derivation of this relationship it is clear that Equ. (5) is not the unique solution of (4). But for the considered problem it is only important that the description of contour lines by an initial-value problem exists. The close affinity between fringe patterns and ordinary differential equations can be demonstrated by the comparison of both patterns in Fig. 3. The left image is a holographic interferogram which was taken to verify the existence of several material faults positioned side by side whereas the right map shows some solutions of the differential equation for the simple pendulum represented graphically by so-called orbits. The considered initial-value problem (6) is characterized by three very important properties. Firstly, Equ. (6) describes a two-dimensional system. Secondly, the right sides of the equations do not depend explicitly on the parameter t. Therefore (6) is a plane, autonomous system. Systems of this kind are well understood in the theory of ordinary differential equations . Their solutions can be represented as orbits (or trajectories) in the plane where an orbit is the set of points traced out by the solution (x(t), y(t)), as t varies. Additionally, system (6) is a Hamiltonian system with the Hamiltonian function d(x,y) because both equations of (6) are obtained from the same scalar function d(x,y) as partial derivatives in an antisymmetric manner. Remark 2: The initial-value problem (6) representing contour lines of the phase difference d is a plane, autonomous Hamiltonian system. These considerations which lead to well known systems of differential equations suggest the in some kind unusual approach applied in this paper. We try to draw conclusions about the appearance of interference patterns by investigating solutions of ordinary differential equations (6). So far it is clear that real contour lines appear if the gradient of the phase difference d is not zero whereas we do not know what is the situation in the opposite case. Regarding the described approach we will get an answer to this question. For a meaningful description of physical processes by differential equations it is necessary that the existence and the uniqueness of solutions are ensured and that they depend in an continuous way on the initial data and any other parameters. This is guaranteed if the right sides of the differential equations satisfy some additional condition, i.e. the Lipschitz- condition . Per definition, a function which can be limited always by a linear function satisfies a Lipschitz-condition. This is not a great restriction because all functions with limited partial derivatives satisfy a Lipschitz-condition. Theorem 3: If the phase difference d possesses continuous first and limited second partial derivatives then the initial-value problem (6) has an unique solution. As pointed out above we are interested in the behaviour of contour lines if the gradient of the phase difference d disappear. Due to the structure of the initial-value system (6) in this case the right sides of both equations are zero. We get so-called critical points. A critical point can be considered as an orbit which is degenerated into a single point. It is useful to determine the topology of the orbits in the neighbourhood of critical points. This will be done in two steps, at first for linear systems and then for nonlinear equations. If both eigenvalues are real and distinct and if they have the same sign then the orbits describe a so-called node. The orbits are sketched in Fig. 4 a). A node is characterized by a dominant orbit which gathers to it all other orbits entering or leaving the critical point, except one single orbit. If both real eigenvalues have opposite sign then the critical point is called a saddle point, Fig. 4 d). A saddle point has two dominant orbits. From the first one all orbits emanate as tŽ -Ľ, and the other gathers all orbits as tŽĽ . If both real eigenvalues are equal the orbits form again a node, Fig. 4 b) and c). There is a single dominant orbit only if the geometric multiplicity is one. If the eigenvalues are a complex-conjugate pair aąib with aš0 and bš0 then the orbits in the neighbourhood of the critical describe a spiral point, Fig. 4 e). If both eigenvalues are pure imaginary and form a complex-conjugate pair ąib with bš0 then the orbits are closed lines and the critical point is a centre, Fig. 4 f). Fig 4: Critical points for linear systems. This completes the classification of critical points for linear systems. We got nodes, saddle points, spiral points and centres. with for Again we assume that no eigenvalue is zero. The classification described above for the linear system (7) is preserved by the nonlinear perturbation in Equ. (8) for nodes, for saddle and spiral points. However, generally a centre for the linear system (7) becomes either a spiral point or a centre for the nonlinear system (8). If dxy.dxy < dxx.dyy holds then both eigenvalues are pure imaginary and the critical point of the corresponding linear system is a centre. If dxy.dxy > dxx.dyy holds then the eigenvalues are real and have opposite sign. In this case the critical point is a saddle point. For the nonlinear Hamiltonian system (6) it follows that critical points can be centres, spiral or saddle points. Further, it can be proved by the theorem of Lioville  that in autonomous Hamiltonian systems spiral points cannot occur. As well for the linear system as for the nonlinear system it was assumed that both eigenvalues are different from zero. In the opposite case the linearized system (8) contains not enough information to describe the orbits near the critical point. Those critical points with disappearing determinant of the coefficient matrix are called degenerated critical points. Although there is a larger variety for degenerated critical points than for non degenerated ones they are not stable in the following sense. If the right sides of the differential equations of the system (6) are changed slightly what happens for example with increasing or decreasing load during the measurement process then any degenerated critical point will change into (usually) two non degenerated critical points. Therefore following classification result is valid. Theorem 4: For the autonomous Hamiltonian system (6), non degenerated critical points are either saddle points, corresponding to a saddle of the phase difference d , or centres, corresponding to a maximum or minimum of the phase difference d.
Theorem 5: A closed orbit for (6) (which corresponds to a periodic solution) contains an odd number of critical points and the number of saddle points is one less than the number of the other critical points. Fig 5: Centres and saddle points in fringe patterns. An result of the considerations above is that spirals and nodes do not appear as orbits in autonomous Hamiltonian systems. So they do not as contour lines in fringe patterns. Non degenerated critical points can be only centres and saddle points. A centre is defined as a family of closed orbits which contain the critical point (Fig.5 a)). This situation is caused by a minimum or a maximum of the phase difference d . Saddle points are characterized by two dominant orbits which converge to the saddle point and gather all other orbits (Fig. 5 b)). The fringe pattern in Fig. 5 c) demonstrates theorem 5: the outer closed fringes contain two centres and one saddle point. So the appearance of saddle points can differ topologically from the shape in Fig. 5 b), they can be formed as loops . In the first part of the paper the hypothesis was stated that the number of fault indicating irregularities in fringe patterns is finite, i.e. each detected material fault can be classified as one of the mentioned partial patterns (or as a combination of them). On the basis of the above described considerations its proof will be now sketched. At first we will consider objects possessing a macroscopically smooth surface without cracks or steps. We assume small deformations which are typically used in non destructive testing. In this case the measured phase difference shows nice properties guarantying an unique solution of the derived system of differential equations (6). Further, we have to distinguish points (x,y) with respect to their gradient gradd(x,y). The points where the gradient of the phase difference is zero correspond to the critical points of system (6). Because of the impossible appearance of other critical points than saddles and centres we get only these two cases which are caused by a saddle or by the local maximum or minimum of the phase difference. Only the latter behaviour of the phase difference may correlate with material defects inside the investigated objects. So we derive the orbits around a centre as the single fault induced pattern in this case which corresponds to the bull eye. On the other hand not every centre is caused by a material fault, i.e. plates loaded by pressure yield centres not induced by any defect. Although centres are characterized by a family of closed orbits not in any case we can observe bright and dark fringes forming the pattern bull eye. 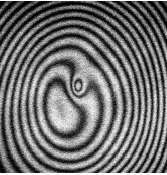 If the surface displacement is very small we might get only a groove or even no visible irregularity. This can be illustrated by a series of synthetic fringe patterns (Fig. 6) which were generated for an faulty object with different defect size . For the biggest fault we get an clear eye in the pattern on the right hand side whereas the eye in the next pattern is rather a hint. In the middle pattern a symmetric distortion of fringes is observed yet but in the pattern on the left hand side no affect of the fault on the pattern can be detected. For the considered case of a disappearing gradient of the phase difference we can conclude that only centres may be caused by material faults. 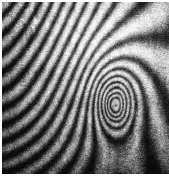 In the interference pattern they may appear as "bull eyes" or as "grooves" depending on the local phase differences . Fig 6: Appearance of centres as critical points in fringe patterns. For regular points, i.e. 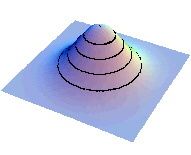 points (x,y) where gradd(x,y)š0, holds the contour line has a defined direction. The lines are related to continuously differentiable solutions of corresponding systems of differential equations. Because of that the resulting orbits are smooth and have no interruptions or sudden changes in direction. The solutions depend in a continuous way from the initial values. Therefore neighbouring fringes in a certain environment behave similarly. In this case local variations of fringes of the same object with and without faults can regard only gradual changes of geometrical fringe properties including especially line direction and curvature. Such irregularities can be observed as grooves of different shape. Very often this happens together with changes of the fringe density, so we get compressions, Fig. 7. Fig 7: "Grooves" and "compressions" in regular points of fringe patterns. The second case regards objects with surfaces which are not smooth macroscopically. This may happen with cracks or steps on the surface, Fig. 8 a) and b). In these cases the measured phase difference d is not a differentiable function which can yield the system of differential equations (6) describing contour lines. Other disturbances appear if d has properties not guarantying an unique solution of the derived system (6). According to theorem 3 this is possible only if d do not possess continuous first and at least limited second partial derivatives. Therefore, we have to consider the affects of non continuous d , non existing or non continuous first partial derivatives and non existing or not limited second partial derivatives of d with respect to x and y. The last case is the less important one. We can assume that all these kinds of "non continuities" appear not only in single points but in a region of connected points. On both sides of the area where d is a non continuous function all considerations regarding the first case are valid. At the border line fringes seem to be displaced to each other. Lines on opposite sides reaching the same point in the non continuity region have different values of phase difference. The fringe pattern for an area of a surface crack or a step on the surface looks like a displacement, Fig. 9 a) and b). The surface crack results in a non continuous island whereas the step effects the whole pattern from the top boundary to the bottom one. Fig 8: Non continuous disturbances of a smooth object surface. The third typical surface disturbance regards an edge on the surface, Fig. 8 c). In this case the first partial derivative do not exist. The observed fringe patterns show characteristic bends on the edge, Fig. 9 c). Their corresponding solutions of the differential equations are not continuously differentiable and the resulting orbits are not smooth lines. Fig 9: "Displacements" and bends in fringe patterns. The aim of the paper was to answer the questions which fringe patterns can appear in holographic interferometry and which of them may be fault induced. In holographic nondestructive testing, material faults are recognized by the identification of characteristic fringe irregularities which are caused by anomalous deformation of the object surface. 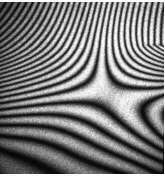 Experiments and numerical simulations led to the hypothesis that the appearance of material faults in interference patterns can be reduced to a finite set of typical fringe irregularities. In the present paper the proof of this statement is sketched. It is based on an mathematical model of the holographic-interferometric image generation process. Interference fringes are considered as contour lines of the interference phase carrying all information about the surface deformation. A relationship between contour lines and plane, autonomous systems of ordinary differential equations is found. Fringes correspond to solutions of initial value problems where the differential equations are defined by the interference phase and the initial value is determined by any point on the line and the fringe order. Together with knowledge about the mechanical behaviour of technical objects exposed to small loads which are used in non-destructive testing the chosen approach allows the above mentioned proof.